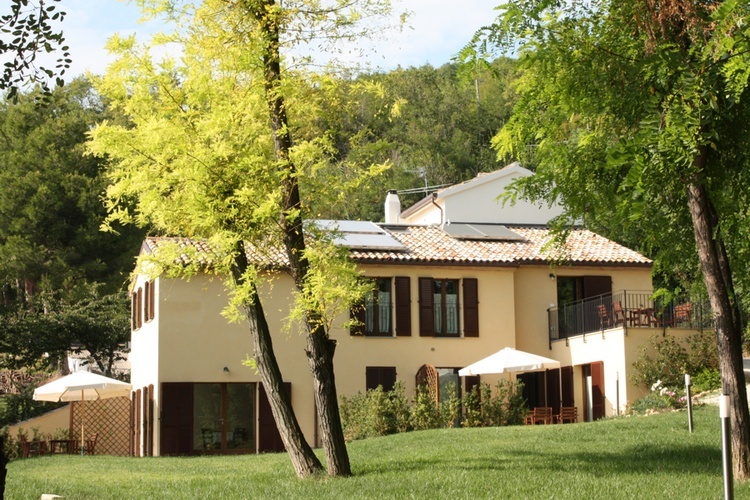 CASE SAN BARTOLO: three apartments in a country house with swimmingpool, panoramic view, in a protected natural park. On a hight of 200 meter, near the Adriatic see. 61121, Europe, Italy, Marche, Pesaro e Urbino ,Parco Monte San Bartolo-Fiorenzuola di Focara,PU. 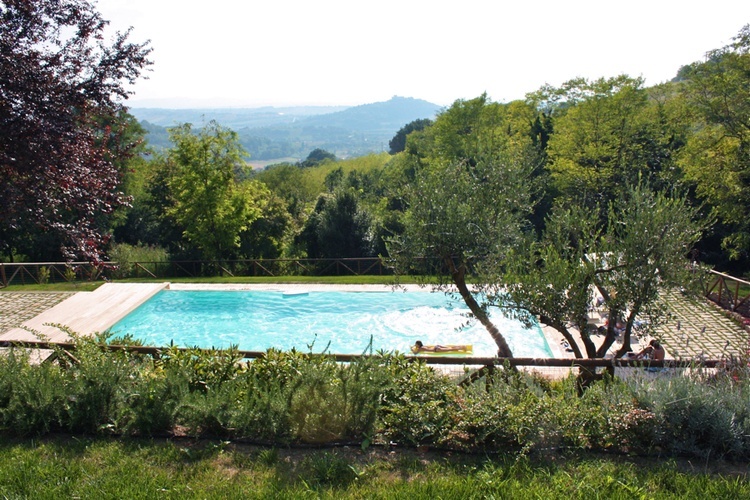 The country house is situated in north of the “Le Marche” region. 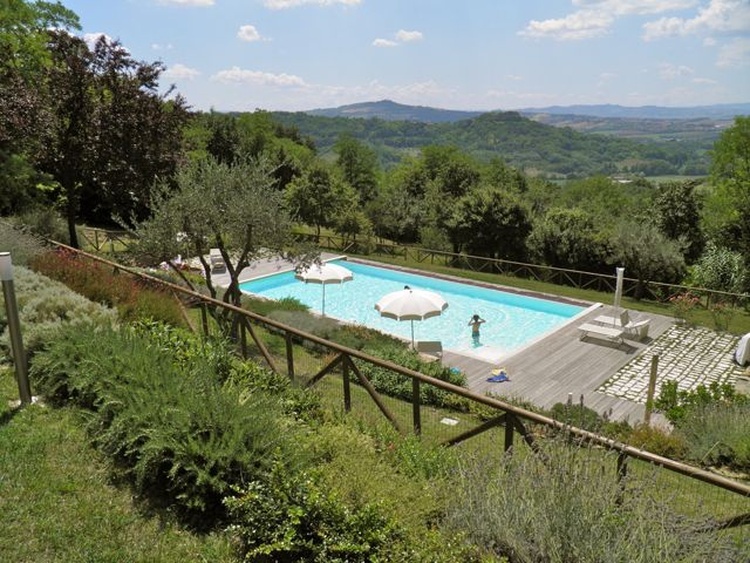 It is secluded in part of a private 3 hectare forest in the middle of the Monte San Bartolo nature park - a rich wooded hilly area (170m above sea level) close to the Adriatic sea. In the park there is a large swimming pool with natural cleaning through the method of salt hydrolyses (without chlorine) and measures 7 x 14 meter. The pool is equipped with deck chairs and sun umbrellas and completely fenced. 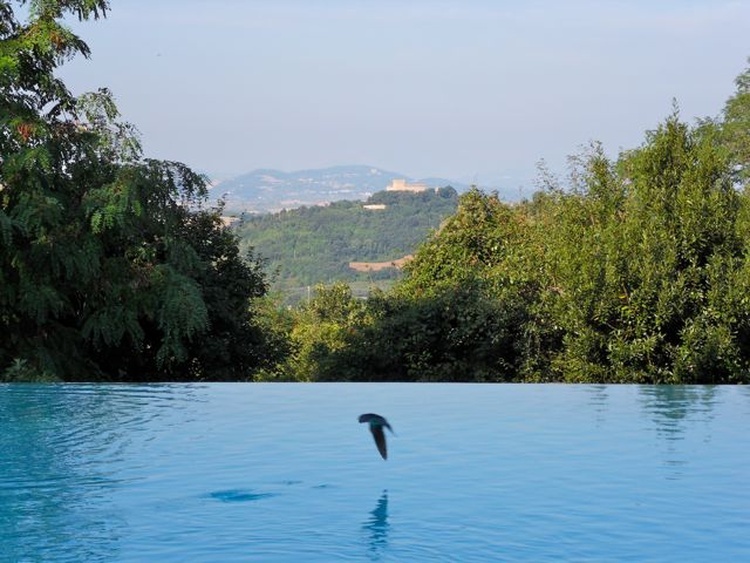 From the swimming pool the guests enjoy a marvelous view on the castle of Gradara and the surounding hills. 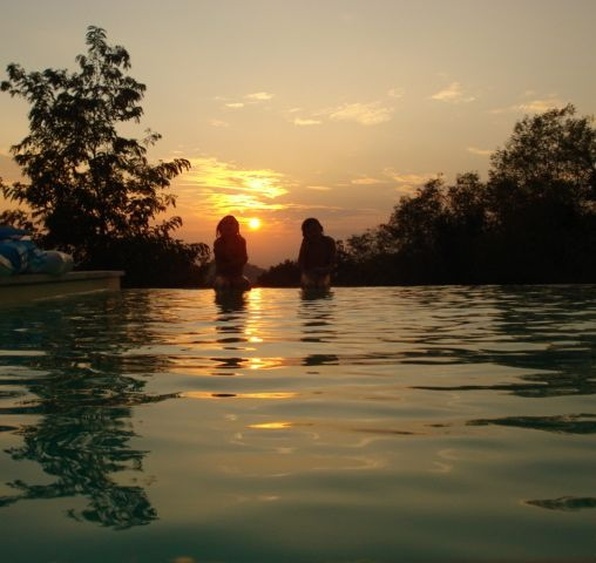 A oases of peace and quietness, ideal for all who are in search for holidays in the middle of nature. 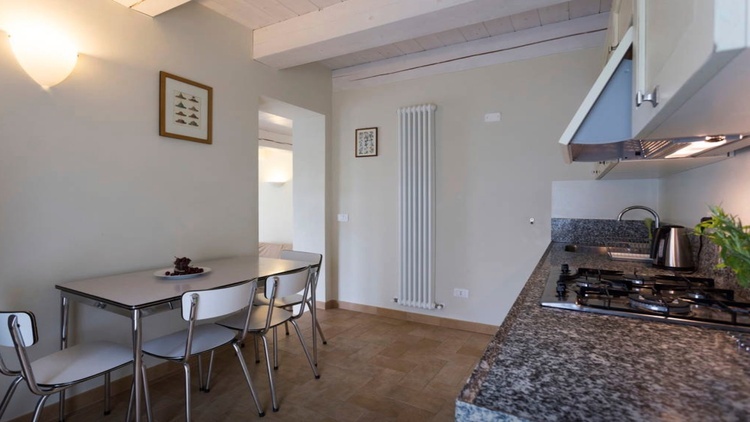 The house has been tastefully renovated and refurnished recently, respecting the environment, into three spacious well equipped apartments. There are two three room and one two room apartments. The garden in front of the apartments is for private use with garden tables and chairs and a parasol. Each apartment has an internet connection. 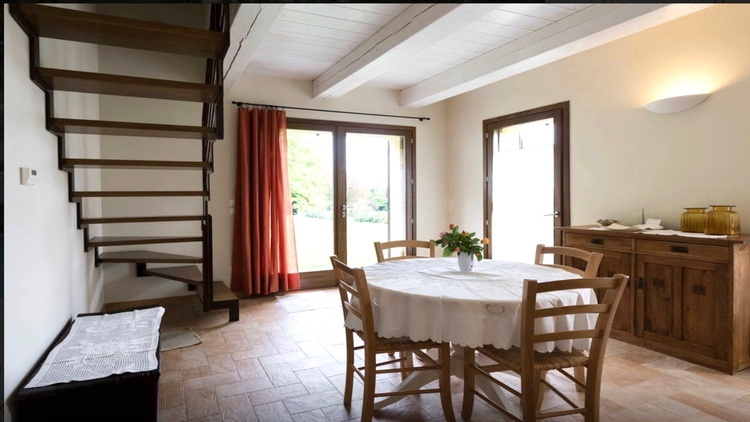 The three-roomed apartment Le Ginestre is large 65 m2 for 4/5 persons and situated on two floors. The ground floor has a spacious living room and open doors to the garden and a separate kitchen. On the first floor are two two persons sleeping rooms with two bathrooms. There is a sofa bed in the living room. Also this apartment has a beautiful wide view on the hillside. The garden that surrounds a part of the apartment is for private use and equipped with a garden set and a sun umbrella. The kitchen is inclusive tea-towels and towels and fully equipped with gas cooker, oven, refrigerator of 128 l with a separate freezer and a dish washer. 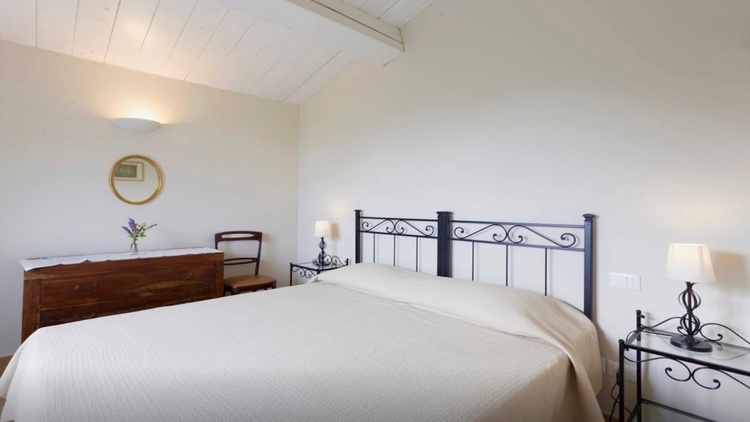 The bedclothes and bath-towels are inclusive and will be replaced once per week . The apartment has an internet connection. 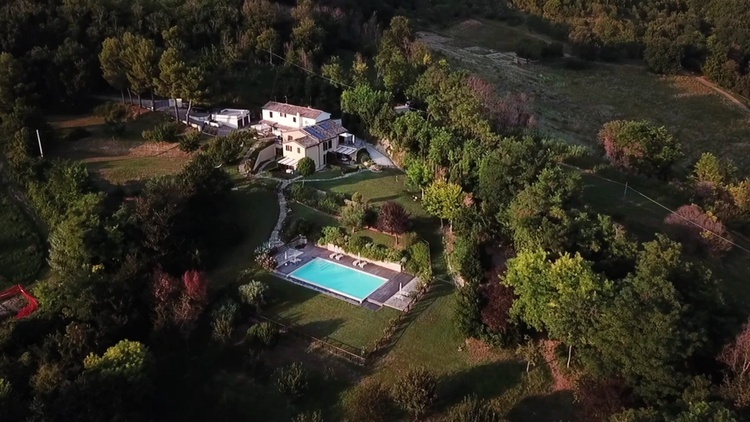 The estate Case San Bartolo is situated on a view minutes distance from middle age villages: Fiorenzuola di Focara, Castel di Mezzo, Gradara, etc. Here there are bars, restaurants and supermarkets. The Adriatic sea and two beautiful beaches are within a stone’s throw distance. Furthermore is the strategic geographical position of Case San Bartolo a ideal starting point for historical, cultural and wine - gastronomic tours in the surrounded area. The hinterland of ‘le Marche’ and Emilia Romagna regions is a territory rich of history and culture. Medieval towns, fortresses, castles and fortified cities are found all over the territory. During the whole year every type of events are organized: concerts, holy festivals, costume festivals, expositions, music at night on the beach, etc. For the lovers of classic music “ The ROSSINI OPERA FESTIVAL “ is organized in the beautifull city of Pesaro (15 minutes distance) during summertime, July and August, with an interesting program at international level.